The article from the architects who won the competition to design BBVA’s new headquarters in Madrid describes the process of formulating the urban and architectural ideas behind the exciting new building that BBVA moved into in 2015. They look at how the project had to find a very specific response to a unique architectural situation and also at how to create an identity that encourages new flexible models of collaborative working. 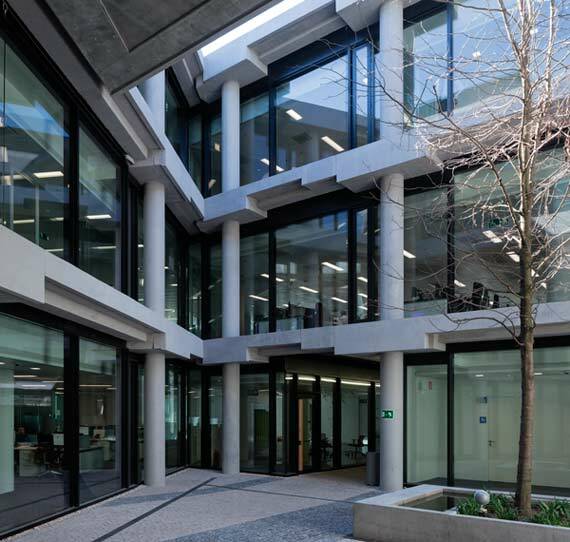 Another vital issue was incorporating the criteria of sustainability as an integral part of the design process; this affected every decision, from the massing of the buildings down to the tiniest technical details. Herzog & de Meuron detail the collaborative process which demonstrated the maturity, perseverance and commitment of all parties involved; a successful collaboration which has resulted in a really outstanding building being produced, one which BBVA can call home and use in the next stage of its evolution. 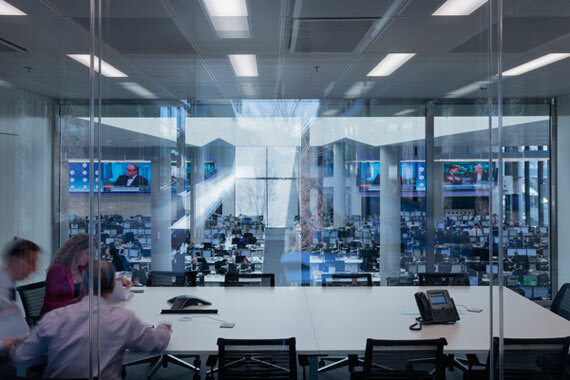 Why has BBVA undertaken the complex and challenging task of concentrating its staff in one single location? Why, in an age of globalization and digitalization, has the bank chosen to build gigantic new headquarters when today’s buzzword is flexible working models? Like other international groups, the bank still believes that personal encounter among staff and with clients is a decisive factor in being successful and competitive. What’s more, architecture and quality at the workplace should encourage identification with the company and good employees to stay on at a time when loyalty tends to be considered old-fashioned and regular job change an indication of personal success. The following thoughts aim to formulate the urban and architectural ideas behind the new headquarters of BBVA in Madrid. We lay no claim to building a reference project. On the contrary, the project is a very specific response to a unique situation. It is about creating an identity for a place that has neither a face nor a history—and about making meaningful use of what is already there. When BBVA invited international architects to submit ideas for a new campus in 2007, employees were still scattered at a variety of locations in the metropolitan area. The bank’s headquarters were housed in a high-rise built in 1981 by Francisco Javier Sáenz de Oiza, who won the competition for the then Banco de Bilbao. It is located at Paseo de la Castellana, Madrid’s prestigious main axis in the center of the city, and is one of the most famous and interesting buildings of its time in Spain. Quality and even avant-garde architecture was already a priority in those days and the new location was meant to follow suit. 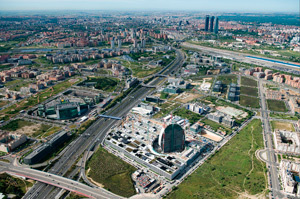 It was necessary to find a piece of land within the city limits of Madrid, large enough to accommodate 6,000 workplaces. The bank found a suitable piece of property near the airport. It is surrounded by through roads in Las Tablas, one of the many burgeoning areas under development around the metropolitan area, thanks to the economic boom and real estate bubble of those days. But it was not an empty piece of land: an office park was under construction, designed by architect Jorge Beroiz for Foresta Parque Industrial. It consisted of eight three-storey buildings, on some of which façades had already been mounted. The buildings, all of the same type and structure, were speculative in nature and intended for sale or rent to various companies. In urban terms, they were isolated blocks with streets in between. One of the key requirements for the competition was to incorporate a considerable part of that architectural substance into the new complex in a first phase. These premises have to be ready for occupation before the new buildings. A “tailor-made” building complex of exceptional architectural quality and representative character is to be created for the new headquarters of BBVA. It should have the potential of becoming an urban landmark. The already existing buildings are a specific challenge. They are to be modified so that they blend into the overall complex. The structure of the buildings is to be clear and rational to ensure economic sustainability. The efficiency and flexibility of the layout have priority. It must be possible to rent or sell parts of individual buildings. The location did not offer many points of urban reference, such as public buildings or spaces for the new complex to relate to. The real “public factor” was the motorway with some 60,000 vehicles driving by every day. As a logical consequence, we developed the campus entirely from inside out, while ensuring that it can be seen from the motorway. We created a town governed by rules and exceptions. The rules define the type of workplaces, the size of the buildings, the way they interrelate, the logic of the circulation and, with it, orientation. Exceptions to the rules are the common areas: central meeting rooms, restaurants, cafés, reception rooms, which, in a real town, would correspond to schools and churches, movie theaters and museums. The rules with their exceptions enabled us to create a diversity of spaces and experiences without having to belabor imagination for its own sake. Integrating the existing buildings was one of the greatest and most stimulating challenges. In contrast to other projects, which are about preserving existing structures, these were neither of historical interest nor of technologically exceptional significance; they were simply a substance that would be irresponsible to destroy. We also wanted to respond architecturally to the climate and culture of Spain. We interpreted urban typologies and took inspiration from the geometric feel of Moorish gardens and the mastery with which they once created a fabric of built and natural worlds. A linear layout of three-storey buildings, repetitive at first sight, covers the entire site, like a carpet interwoven with lanes, gardens and cross connections. The existing buildings are part of this low-rise fabric which accommodates most of the workplaces. 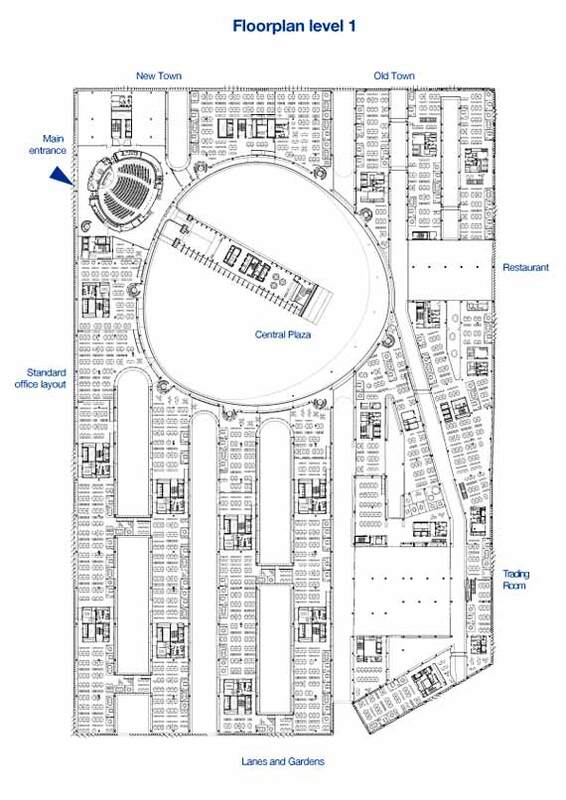 This overall structure is cut out in one spot to create a central Plaza. It is the middle of the new town, with such facilities as cafés, restaurants and central meeting rooms. It is shaped like a circle that has been drawn freehand. 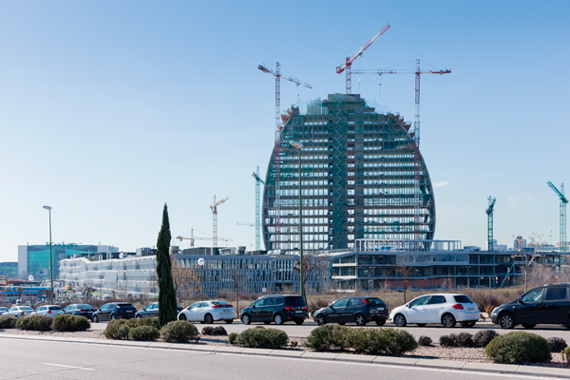 A high-rise building placed on the Plaza makes the new campus of the bank visible to drivers passing by and inscribes BBVA in the skyline of Madrid. It has approximately the same shape as the Plaza and also serves as a point of orientation from within the town. Employees are able to walk through the Campus to reach their place of work on foot. Streets, squares, gardens, lanes, and stairs are places of encounter; lifts are not. The buildings are narrow. Abundant daylight is atmospheric and a benefit in terms of artificial lighting and energy consumption. Relatively small spaces establish a more personal environment in contrast to traditional open-plan offices. Largely transparent façades allow for visual connections between the buildings. Interior and exterior spaces overlap; the distinction between them is blurred. One can look through the complex from one end to the other. This generates ambivalence—is it one single building or a number of individual ones? The existing buildings resemble the new ones. The workplaces should be similar for all the employees regardless of whether they are situated in the “old” or new part of the complex. The section of the buildings follows the natural topography although there is an underground garage. The wings, some of them very long, are therefore divided into shorter, stepped sections. The end of each lane segues seamlessly into the surrounding (urban) landscape. The natural environment is an integral constituent of the architecture and the workplace. Linear gardens run parallel to the long buildings with different kinds of vegetation, facilitating orientation. Water, collected on the roofs and in the gardens, is stored in a central cistern near the high-rise building and, from there, distributed again to water the gardens. At the oral presentation of the competition entry, we were already asked by the bank if the texture of this low-rise carpet could be revisited. Interestingly, redesign of the existing structures after the competition in the “Old town” resulted in lanes that have the scale of the alleys called for in the original proposal for the new part of town. These buildings are already in use now, and people really seem to like the ambiance in the streets, the urbanity as well as the light conditions in their offices. We are pleased that this original concept comes to the fore in the old part of town and it will be interesting to compare the different scales of streets, lanes and gardens throughout the complex. The variations may well be enriching. There is one place in the town where everyone meets: the Plaza. Its shape symbolizes community; it is a kind of arena. But while similar precedents are characterized by emptiness, 145 trees will be planted here in sandy ground. Walkways around the Plaza link the buildings in the horizontal town with each other and with the high-rise building. 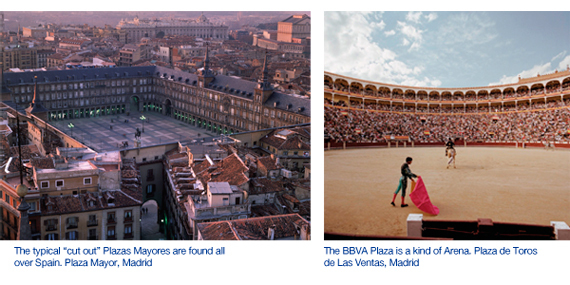 It is a coincidence that the size of the Plaza, some 100 meters in diameter, corresponds to that of the Plaza de Toros de Las Ventas in Madrid. We have also adopted another traditional element of city planning in Spain by cutting a free-form out of the existing urban fabric. Such plazas are found in various larger and smaller cities throughout Spain and, not seldom, they are named Plaza Mayor as in Madrid, which is also comparable in size to the BBVA Plaza. Since the circle of the Plaza is slightly distorted as if drawn by hand, the space is less monumental than it would be if it were a perfect circle. It is like the shape outlined by people gathered around a fire. The high-rise building divides the Plaza in half: the ground floor of the tower is an outside space, a kind of arcade that links the sunny and shady sides of the Plaza. The high-rise building is only 12 meters in depth, as narrow as the height of the lower buildings. It is more or less the shape of the Plaza, the arena, and therefore looks as if it had been cut out of the carpet and upended. The “eccentric” shape is both baffling and fascinating; there is something ambivalent about it. It threatens to start rolling away or even tip over; it is precarious and possibly even frightening. However, the soft contours and transparency of the building also make it fragile and delicate. The high-rise accentuates the visibility of the bank to the outside world and contributes to orientation from within. It can be seen from almost everywhere and thus marks the location of the central Plaza. It not only towers above the complex; it also serves as an anchor. Someone recently remarked that it is like the church in a village. 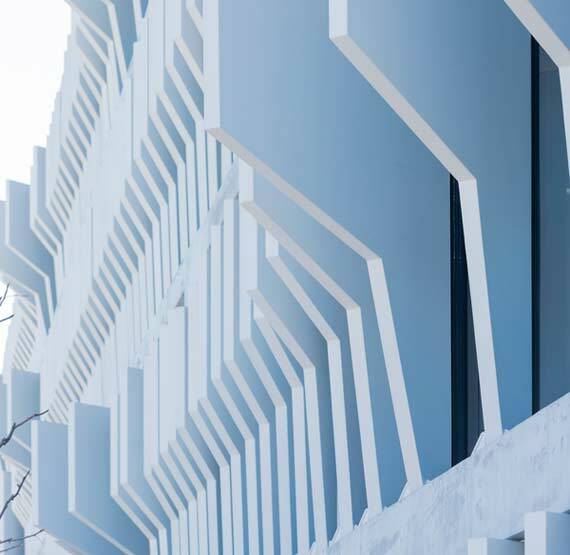 In combination with the high-rise, the brise-soleils are the most important feature of the face of BBVA’s new headquarters. The organization inside is simple, governed by the building’s slender shape: a central core with lifts and restrooms, with a room each to left and right, ideally as an open working area. It is not often that one can look out of the opposite sides of a high-rise. These spaces, which offer spectacular views of the city and the sierra, accommodate programmatic areas from work stations to communal functions for the entire bank. Herzog & de Meuron designed part of the interiors of the low-rise buildings and of the high-rise. 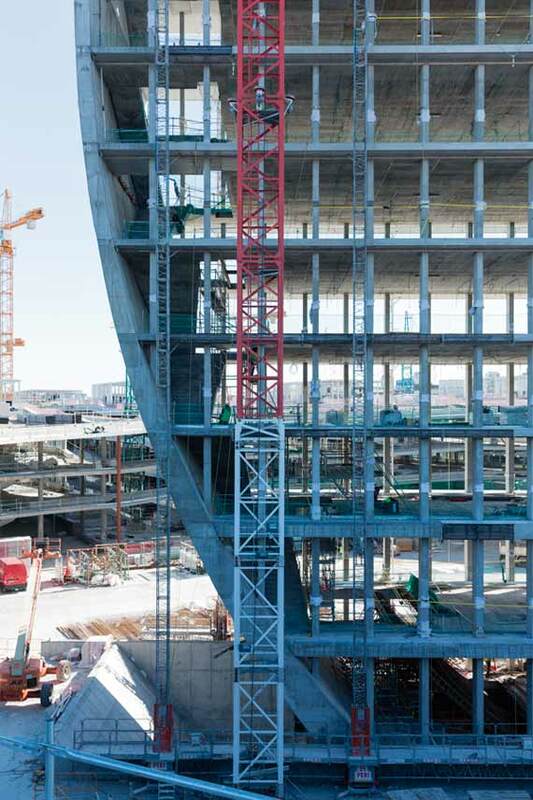 Emergency stairs follow the curve of the façades along the contours of the building to minimize the size of the core. It was only later on that we fully realized how spectacular the resulting spaces would be. In the beginning the high-rise was aligned with the horizontal wings. 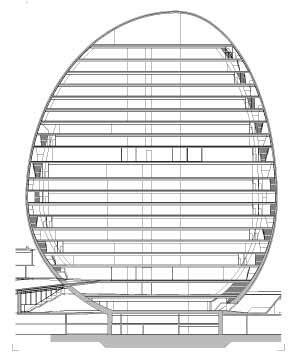 In connection with the design of the façade and related solar studies, we realized that the tower should ideally face south. Since the sun is high overhead in the south, a two-meter overhang provides enough shade for the standard office storeys without requiring additional vertical or movable shading devices on the exterior. Fixed brise-soleils as in the flat buildings would have obstructed the desired view from up there. Outdoor solar protection on a high-rise is not advisable because of maintenance. The north façade requires no exterior sun protection at all, allowing for a smaller overhang, only so deep as to facilitate cleaning the façade. The new orientation of the high-rise ensures full-height transparency and a maximum of spectacular views. The proper placement of the building allowed for considerable savings in terms of building costs and energy consumption. Interestingly, as often happens, this “reasonable” decision led to other improvements. Since the high-rise is quite literally “path breaking,” we aligned the main entrance with the tower and moved it to the northwest corner of the complex, which makes it more striking than if it had been accessed via one of the many lengthwise lanes. In a second step, we shifted the tower closer to the entrance so that it touches the so-called ring that runs around the entire Plaza as an outdoor space on the first floor. Finally, by deviating from the overall geometric grid, the modified orientation of the tower makes it more visible from inside the complex and underscores its eccentricity. 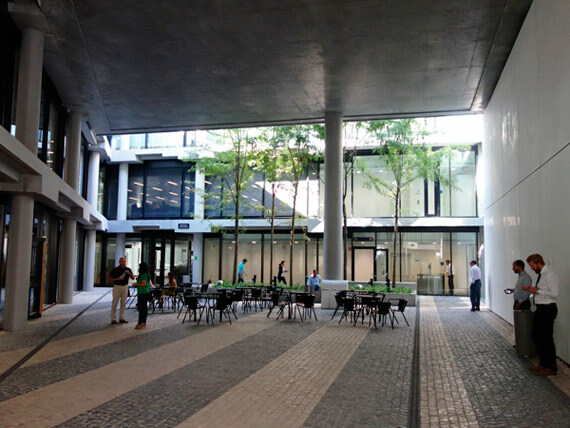 In the competition design, we cut elongated courtyards into the existing structures in order to establish a connection across the streets between the buildings of the previous office park. In the next phase, we realized that reducing the building volume was not enough. There was still no cogent relationship between the existing structures and the “carpet” of new buildings. In addition, to accommodate the bank’s need for more office area in the first phase of construction, we filled in several spaces between the existing buildings. As a result, a large semi-circular courtyard was eliminated that would have become an alien geometry in between the old and new parts of town. The fill-in also resulted in a clearly identifiable main passageway that accesses all of the existing buildings and links them to the main Plaza. It became the longest and narrowest lane in the town. It was only by “swallowing” the old structures that the first phase of construction also became a fabric of linear buildings and lanes like that of the new buildings. The blend of old and new generated extremely interesting spatial transitions and variations in both floor plan and elevation; irregularities resulted. Some of the buildings, for instance, had diagonal geometries, which generated two bends in the main lane, so that our office nicknamed it Broadway. Existing buildings were placed staggered in the terrain; they were not at the same height because they had initially been planned as freestanding office buildings. The connections between the parts yielded slanted roofs and floors and also generated the natural feel of sloping lanes and courtyards. The necessity of linking loose parts, the overlapping of physically existing, irregular structures with the Cartesian order of new buildings and the great density of the first phase of construction that led to narrow lanes—these factors all converge to lend this part of the complex a very distinctive character. One might even say that it feels a little bit like a medieval town with its narrow, crooked streets and occasional dead ends. In contrast, the new part of town further west is characterized by clear rational geometries, a great deal of light and air and considerable repetition. Two very large rooms were already required in the first phase, the Trading Room and a Restaurant, for which the standard height of the existing offices did not suffice. We therefore had to remove ceilings inside existing buildings and we tried to establish a visual correspondence between these interiors and the linear lanes and courtyards outside. Both of these areas, occupied by many people at once, are exceptions in the fabric of office wings, which are all similar in size. They are like interior plazas and offer useful points of orientation. The distinction between indoor and outdoor is blurred. To cover this subject would require an article of its own. However, a brief summary follows. Apart from the reuse of the existing structures, the entire complex was based on the principle of “passive architecture.” This means incorporating the criteria of sustainability as an integral part of the design process, which affects every decision from the massing of the buildings down to the technical details. The aim is first to reduce the energy consumption and then to cover the remaining needs with sustainable resources. The most obvious measures taken are rigorous solar protection, water management, and low-energy consumption systems. (BBVA Madrid Headquarters is the largest complex in Europe illuminated only with LED technology.) Our aim is to satisfy the requirements for the LEED gold certificate. The existing buildings were also the most important point of departure for designing the façades throughout the new town. It did not make sense to us to remove the cheap, standardized cladding and replace it with “more beautiful” cladding of higher quality. By means of subtle distinctions, we wanted to express that some of the buildings are renovated and others entirely new. To this end, we moved all of the glazing inside and left the “naked” concrete supports and slabs on the outside. We show the raw structure of the existing buildings as it is; it remains visible although that was never part of the plan. We applied the same strategy of showing unclad supports and slabs on the exterior of the new buildings, both low-rise and high-rise. Wherever possible, we also made structural and functional use of the exterior concrete elements. Upstand beams running the length of the façade in the horizontal wings and around the Plaza allow for larger spans between the supports. These upstands simultaneously serve as benches, while cantilevered slabs can be used as balconies and passageways, thereby animating the architecture in the truest sense of the word. The three-dimensional structural elements on the exterior are also part of the shading. They cast shadows and capture sunlight; they create contrasts in a fashion that could never be achieved by a flush glass or metal façade. The sculptural syntax of concrete has taken root in architecture the world over ever since classical modernism and seems to us particularly suitable in the searing sunlight of southern latitudes. In the high-rise, horizontal concrete cantilevers establish an affinity with the design of the lower buildings and lend it a raw appearance. In contrast to the buildings in the “carpet,” the glazing in the high-rise rests outside on supports. As a result, there are no window mullions visible from inside on the regular floors; the very large panes of glass affording spectacular views over Madrid are framed by unclad concrete supports. In this way, the raw character of the building is felt inside as well. The outline of the high-rise, the “ring,” is clad in aluminium panels. This weather protection ends shortly above the ground. On the lowest floors, the ring is exposed, where it melts into the horizontal walkways around the Plaza and the ramp in front of the main entrance. Along the outer façade of the new town, brise-soleils, in various scales, are inserted between the horizontal slabs. These immovable storey-height elements are placed in front of both the existing and the new structures, linking old and new and making a unity of them. The result might be compared to a slatted fence encompassing the town, as in medieval times. At certain points, they are interrupted, creating gates that provide access to the BBVA town. 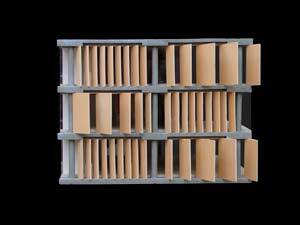 From an environmental standpoint, the brise-soleils block the sun and reduce the need for air conditioning. Their distinctive shape has been achieved through prolonged study to establish the ideal balance between sun protection, daylight and view. Their angle in relationship to the glass façade varies depending on orientation of the façade and corresponding to the course of the sun. The brise-soleils are made of fiberglass. The weight of concrete would have put unnecessary loads on the structure and would have been too costly. Having settled on the choice of material, we then decided to make them white, which increases the daylight projected indoors and draws attention to the difference in material. Working out the brise-soleils was crucial to the development of the project after the competition. In combination with the high-rise, they are the most important feature in defining the face of BBVA’s new headquarters. We started out by working with simple right-angled panels, but these obstructed too much of the view. We then tried making them smaller at the bottom and reducing the mass just enough to ensure satisfactory solar protection. Before arriving at their final shape, we also studied three-dimensional elements, but they proved to be too technically challenging and therefore too expensive to produce. In terms of design, they would probably also have been too intrusive. 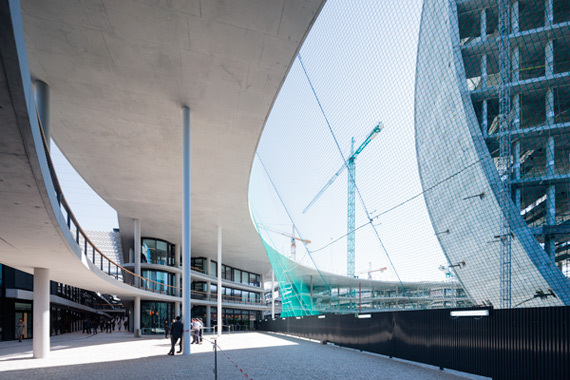 Inside the complex, movable textiles provide solar protection. While vertical blinds shade the windows facing the wider linear gardens in the new part of town, toldos cover the narrow lanes of the “old town.” These white horizontal awnings on cables, similar to those known from cities like Seville, periodically alternate with plants growing down the ropes. The play between fabric and vegetation adds rhythm to the light in the lanes but it was also the only means of including natural elements within the narrow spaces. It was not possible to load the underground garage with a layer of soil in order to plant from the ground. The difference between interior and exterior protection from the sun is also a consequence of the somewhat barren surroundings in Las Tablas, especially the motorway, which we wanted to block from view. 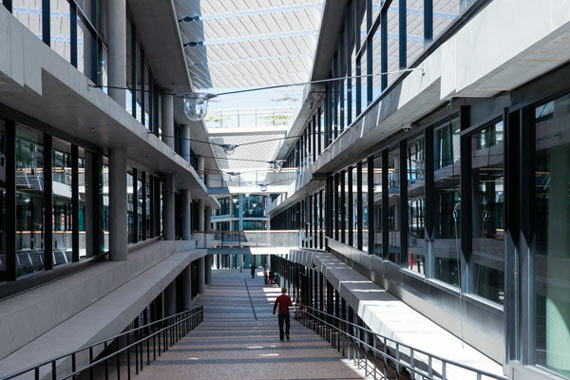 Inside, however, protection should be activated only when the sun is really shining in to ensure that the buildings remain as open and transparent as possible on sunny days as well. On the one hand, we wanted to maximize reference to the outdoors in this horizontal town by maximizing the view into the gardens. The vegetation is one of the factors that contribute to the individuality and placement of each employee within the complex as a whole. The difference between one person’s desk and that of a colleague lies, among other things, in the tree that is seen growing in front of the window. On the other hand, we wanted to generate the sensation at every workplace that the complex is one large whole, that the departments of the bank, even when they are housed in different buildings, all belong together, like different parts of one and the same body. To describe it from a user perspective: you could be sitting in wing C, observing that shy, attractive person in wing D for years without ever talking to them—and still know that you somehow belong together, like neighbors, and not just because you happen to have the same employer. In contrast to most campuses, comprised of single buildings laid out in one way or another, the BBVA headquarters are at once a single building and a multifaceted town. For us, this ambiguity is essential to the project. We feel there is a fruitful and intriguing potential in things that are not quite black and white. A certain amount of persuasion was required to make us participate in the competition for the new BBVA headquarters. We were reluctant for several reasons: the urban location posed a considerable challenge, the incorporation of half-finished office buildings promised to be complicated and, at the time, our office was very busy with a number of other projects. In retrospect, we realize that the great potential of this project actually lay in the complexity of its givens. It is almost surprising to see what has come of it and we are very grateful to the bank that they insisted. It has become a project of high specificity and identity. The campus has an atmosphere that fosters the feeling of being in a new town: there are lanes, streets, plazas and gardens, small buildings and big ones, new and old ones, rules and exceptions. It is astonishing to experience a real sense of urban density when there is a slight backup at the main entrance during rush hour. It is only at second sight that we realize that these are headquarters, and that this is one company. And what if we could look into the distant future? What would become of this town, tailor-made for the bank, if BBVA should someday decide to move on? Everything has been prepared so that anyone could move in here at any time. But maybe something else will happen rather than simply having other services occupy the premises. Maybe, if the walls come down someday, the surrounding city, characterized by large-scale building blocks, will discover the narrow lanes, the squares and gardens, and will turn them into its own new center, where people live and work, eat and sleep—just like the perfectly natural evolution of old village centers that are swallowed up by growing metropolitan areas and in turn give the cities an identity by mutating into their historical cores. But let’s return to the present. BBVA began moving in to the first part of their new premises last summer and the remaining employees in Madrid will move in next summer. At the latest when the trees have taken root and grown, and the ground has acquired a patina, people will begin to feel at home here. It’s only after tomorrow that the new won’t feel so brand new anymore. We hope that the inhabitants will soon take possession of their new town, living and working there with no thought of the architects who built it. Good architecture cannot come about without a good client. The many people in charge at BBVA were extremely engaged and committed, consistently detailing their requirements for us, for other planners, and for the contractors. They had the immense responsibility of making sure that what they got would ultimately make functional, economic, social, and environmental sense for the thousands of employees they represent, whilst trying to maintain the identity of a project that was evaluated and finally chosen through a meticulous process and by a qualified jury. On rereading the original competition entry, which we designed without any exchange with the client, we realize that what we see today is still quite the same project. This is astonishing, given the differences described above. This does not mean that we were right and it does not mean that we won more battles. But it does demonstrate the maturity, perseverance and commitment of all parties involved. Something really outstanding has become a reality because diverging concerns regarding details were always settled without putting the overall vision at risk. We want to thank EVERYBODY involved wholeheartedly for their personal contribution to this successful collaboration. Herzog & de Meuron. 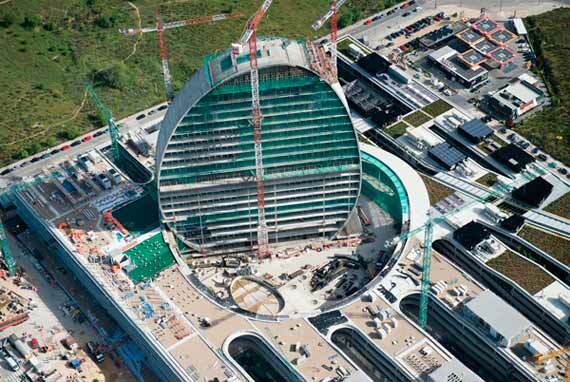 "A Single Building and a Multifaceted Town: BBVA, Madrid, a Workplace for the Future." In Reinventing the Company in the Digital Age. Madrid: BBVA, 2014.